First person interviews during the Egyptian uprising. Where will you be March 18-20? 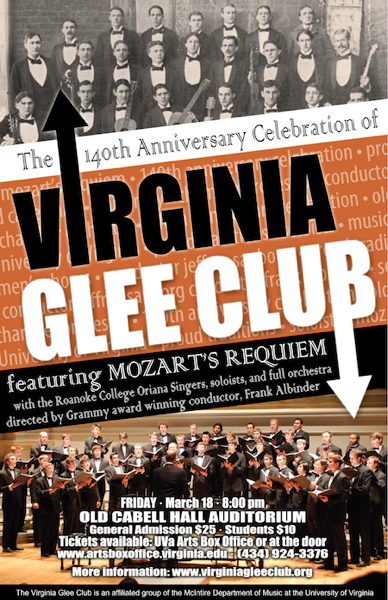 The official poster for next month’s Virginia Glee Club 140th anniversary/reunion weekend has been released. Looking forward to seeing many of you there. My travel plans have just firmed up–I’ll be driving down on the 17th (um, does anyone in the DC area have a couch I can crash on that Thursday night? ), then heading into Charlottesville on Friday for a research day in the Special Collections Library. From then on, it’s the reunion activities. And it should be a lot of fun. Author Tim JarrettPosted on February 21, 2011 May 6, 2013 Categories Music, VirginiaTags virginiagleeclubLeave a comment on Where will you be March 18-20?